Click the Join the meeting link, provided on the webinar's description page and in the webinar announcement email (, approximately 5 minutes before the webinar starts. A new webpage will ask for your name and email address. Type in your name and email. If prompted, click 'Join' to enter the webinar. 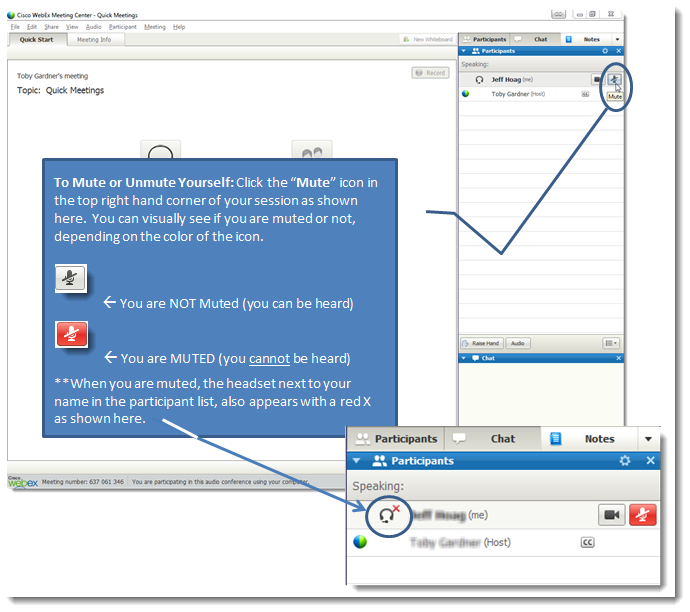 To connect and listen to the webinar on your computer (highly recommended), select 'Call Using Computer' (see image 1, below). This uses your computer's speakers and microphone. If you need to adjust your speaker or microphone settings, click Audio + Computer Audio Settings in the menu bar. 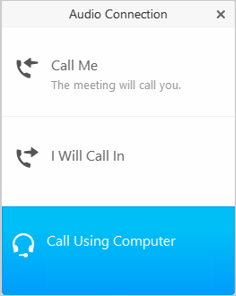 To connect to the webinar by phone, select either 'Call Me' or 'I Will Call In'. You can find global call-in numbers here. Once the webinar has started, it is critical that you put your microphone on mute by clicking the microphone button so that it turns red. See image 2, below. If you can't join the meeting, go to the WebEx Help page.